A lot of cyclists are emerging from their basements, garages, and pain caves to put in more outdoor miles as temperatures rise and days get longer in the Northern Hemisphere. This period marks a transition for many cyclists and triathletes from shorter 60-90 minute indoor interval workouts to longer outdoor rides. Athletes who want to climb faster this summer now have more opportunity to train on actual climbs, and here’s what you should do when you get to them. If you’re working toward a big trip to Colorado or another mountainous destination, or you’re getting ready for a hill climb time trial or hilly Gran Fondo, you’re going to want to gradually make your training more specific to going fast uphill. An often-overlooked component of building climbing speed is over-geared climbing. During MuscleTension intervals you are pedaling slowly (about 50-55 rpm cadence) against a heavy resistance. The point is to engage more muscle fibers to generate the necessary force to continue climbing. Remember, power is the product of force and angular velocity (cadence), meaning there’s an inverse relationship between force and cadence; it requires more force to produce a significant amount of power at a lower cadence. The benefit of producing more force and recruiting more muscle fiber now is that you are teaching your body to continue recruiting more muscle fiber even as you change the focus of your training to higher-cadence, lower-force workouts like SteadyState and ClimbingRepeats (lactate threshold intervals), or general endurance riding. Prolonged high-force intervals at an aerobic cardiovascular intensity may also lead a subset of fast-twitch (Type II) muscle fibers to change their characteristics and behave more like endurance-friendly slow-twitch (Type I) fibers. Together these adaptations prepare muscles to produce more power and resist fatigue when you transition to lactate threshold climbing efforts at 80-90rpm. Even as you increase cadence you will retain some of the increased ability to produce greater force, which means you’ll likely see an increase in climbing power when you bring your climbing cadence back up to 80+ rpm. Fatigue resistance, which can also be observed as an ability to maintain a given intensity longer, mostly comes from improving cardiovascular fitness. But when you increase muscle fiber recruitment you also spread the workload of producing power over more muscle fibers, which increases the time it takes for the whole muscle to fatigue. And with the added adaptation of some fast-twitch fibers behaving more like slow-twitch fibers, MuscleTension intervals effectively give an endurance cyclist (as opposed to a track sprinter) more muscle fibers to work with that are adapted to your particular sporting goal. MuscleTension intervals are deceptively simple. To perform them well you need a climb that lasts 5-10 minutes. The grade doesn’t have to be steep (although it can be); a steady 1-2% false flat will work if that’s all you have. If you don’t have any hills to work with, riding over geared into a strong headwind will work. The key is to balance your gearing and the grade so you are grinding along at about 50-55 rpm and maintaining a power output higher than your aerobic “cruising” power and lower than your lactate threshold power. Although it is good to ride MuscleTension intervals using a variety of hand positions (this is a workout we use to help athletes adapt to aero positions and riding in the drops, too), most people find them to be most comfortable and productive with their hands on the tops of the bars. Aim to keep your upper body quiet during these intervals; focus the effort through your hips and legs rather than throwing your shoulders and head into it. When MuscleTension Intervals are too long your muscles fatigue, power drops, cardiovascular intensity drops, and you end up riding a low-cadence, low-force aerobic interval. The force is important, so it’s important to keep intervals at 5-10 minutes in length and increase workload by adding intervals if necessary. Total time-at-intensity for a single workout should be around 20 minutes for beginners, 30 minutes for intermediate riders, and 40 for advanced riders (doesn’t need to be exact). You can divide that total time-at-intensity a variety of ways: 3×7 minutes, 4×5 minutes, 2×15 minutes, 3×12 minutes, etc. 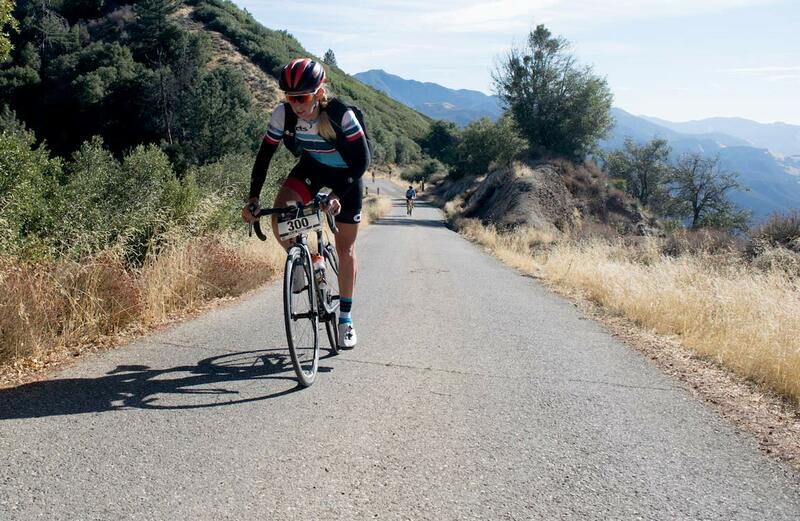 A good starting point for beginner and intermediate riders would be 4x 5-minute MT intervals. Recovery between intervals should be equal to the duration of the efforts, so you should take 6 minutes of easy spinning recovery between 6-minute MuscleTension intervals. A two to three-week block focused on MuscleTension intervals is a good use of your time. Within this block, beginner and intermediate riders should separate MT workouts by at least a full day. You can do endurance rides, group rides, and drill work on these days, but high-intensity intervals (VO2 max work, sprints) would be counterproductive. Experienced and/or advanced riders can often do MuscleTension intervals on back-to-back days, just be careful to take enough recovery time following those 2-day blocks. MuscleTension Intervals are a great first step toward high-speed climbing fitness later in the spring and summer because they give you tools you can leverage when you move on to building greater climbing power at lactate threshold. So, get grinding!